Calling the plans for the purchase of Joint Strike Fighters too costly, the Navy today unveiled an aircraft it says will put the service at the forefront of stealth fighter technology for the 21st century and even beyond. 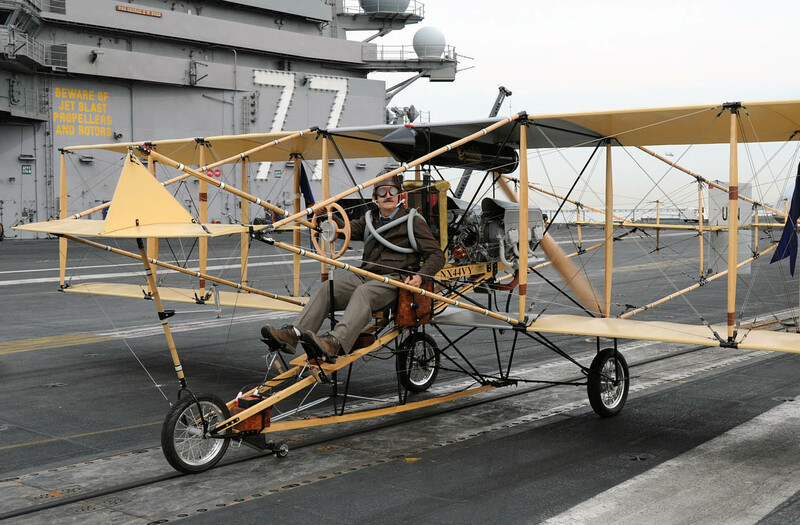 Navy officials revealed the Curtiss pusher biplane on the decks of the aircraft carrier George H.W. Bush Nov. 15, calling it “leap-forward technology” for merely a fraction of the cost of all previous stealth fighter programs. All right, that’s enough. In reality, this is just a nifty photo showing a replica of the plane that made history 100 years ago when it made the first flight off a Navy ship at sea. A Navy spokesman said the plane was not flown but was hoisted aboard the mighty George H.W. Bush, although the pilot, retired Navy Cmdr. Bob Coolbaugh, would sure have liked to fly off. Distinguished colleague Bill McMichael wrote about the replica last week. And here I was thinking this was an exclusive shot of the replacement STOL strike aircraft for the Marines now that Lock-Mart has lost the RN buy and the budget vultures are circling the JSF Bravo model.